I played with moving my antenna around, without much luck. Then I remembered something the guys told me when I bought my antenna. Stick it on a metal filing cabinet. 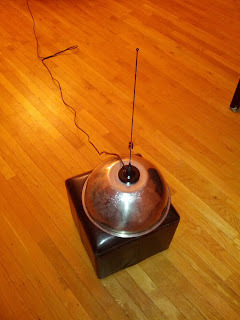 I started to research antennas, and realized they need to be grounded. I wondered if that was what was going on. Finally, I was able to make contact with someone on the air, who informed me, yet, I did need to ground it. He suggested a pizza pan. I found a metal bowl, placed face down, and suddenly, my signal got much better. I was able to talk with 5W unintelligibly, and easily with 10W. Yeah! So, the bottom line is, grounding antennas helps. Even if it is just a fairly large piece of metal, that will make a world of a difference!